NASA's Jet Propulsion Laboratory is feeling the heat from awildfire burning only a couple of miles away, but the research facility isn'tunder any immediate threat, officials have said. The so-called Station fire is burning in the Angeles National Forest nearhomes on the northside of La Ca?ada Flintridge, according to news reports.The fire is about 2 miles from JPL. 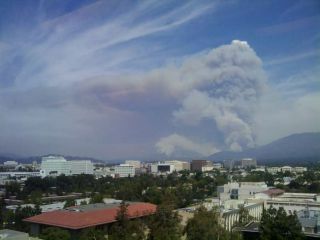 Astronomer Mike Brown of Caltech snapped a picture of thefire's smoke plume from the 9th floor of the Caltech library, looking northeasttowards downtown Pasadena and JPL. "It looks to me like they are in a sea of calm betweentwo different fires," Brown told SPACE.com. For now, JPL officials are working with L.A. County firefightersand keeping an eye on the blaze. No evacuations have been ordered so far. "The JPL fire dept. and other personnel are monitoringthe fire, but there is no immediate danger of it reaching JPL," NASAspokeswoman Jane Platt told SPACE.com. "A major brush fire is still burning in the hills northof JPL.? JPL is not in any immediate danger.? The air quality in the area isvery poor, and employees on the premises are being told to stop all outsidework and remain inside."